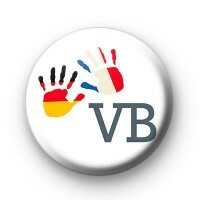 Custom languages badge for Victoria Bruff featuring French & German hands - used for teaching languages to children. Standard 25mm button badge with copper D pin back. Made from metal with a plastic coated design.